Clare County was fondly named by an early Irish settler after his beloved County Clare in Ireland. Many reminders of this Irish heritage are evident throughout Clare. Visit the historic Doherty Hotel, Clare turns green every March as we celebrate our heritage in the annual St. Patrick’s Day Celebration. Clare’s Irish connection and turn of the century architecture invites our visitors to dig deeper into our story. Railroads, logging, and even a gangster or two are part of our colorful past. For more information on Clare MI, please visit the Clare Area Chamber of Commerce. 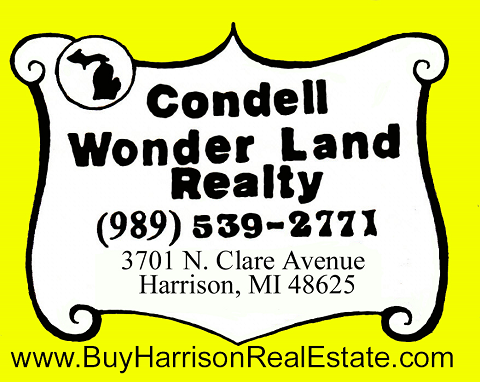 Condell Wonder Land Realty has a great selection of all types of Northern Michigan Real Estate and has been listing and selling Clare MI. Real Estate for many years, so if you are looking to buy or sell property in Clare, MI. please contact us!